The MVCMA grew out of the religious “campmeeting” movement of the 19th century. The MVCMA was listed in the National Register of Historic Places on December 14, 1978, and was declared a National Historic Landmark on April 5, 2005. The Tabernacle was declared a Save America’s Treasures project on July 28, 2000. The grounds of the Martha’s Vineyard Camp Meeting Association (MVCMA), formerly known as “Wesleyan Grove,” are historically significant for several reasons: These include the carefully recorded historic connection with the religious “camp meeting” movement of the early 19th century, the unique layout of the grounds emulated by many post Civil War camp meeting sites, the original architectural form of the “Martha’s Vineyard” cottages built between 1859-1880, the unique iron Tabernacle erected in 1879 and the area’s remarkable state of preservation. The MVCMA grew out of the religious camp meeting movement of the 19th century. The idea of holding camp meetings for religious purposes was first introduced by the Presbyterians with Baptists and Methodists taking part in the state of Kentucky, prior to 1820. The practice was soon followed by the Methodists in New England. Initially, these early meetings were temporary, lasting about a week and held at different locations each year. The living conditions were primitive. People slept in tents with straw spread on the ground or on a board floor with a blanket over them. The food was prepared a week in advance. The people brought with them what they needed, and took everything away again when they left. By the middle of the 19th century, the camp meetings became more permanently established and were held in particular locations over a series of years. The first camp meeting on Cape Cod was held at Bound Brook, Wellfleet near the Truro line in 1819. Other early meetings were held at Falmouth and Sandwich. The Vineyard’s first camp meeting was held at West Chop in 1827. The man responsible for this camp meeting was Rev. John “Reformation John” Adams. Jeremiah Pease, a staunch follower of Rev. Adams, was directly responsible for the beginning of the MVCMA. In 1835, Jeremiah Pease gathered a group of six men from the Edgartown Methodist Church to inspect a place he had found in a “venerable grove of oaks,” located on land which was part of William Butler’s sheep pasture, for the purpose of holding a religious camp meeting. The original half-acre site was located in what was then the northern reaches of Edgartown township close to Nantucket Sound. The land sloped gently, embracing a fresh water lake and shelving onto a white beach. Bordering the grove was the sheep pasture. The site was cleared of underbrush and a driftwood shed erected for the preachers with a stand built onto its front to serve as a pulpit. In front of this was the usual arrangement of a temporary altar, consisting of a railing enclosing a space about 25 feet by 12 feet with benches to be used mainly by the singers during the preaching service and as a place for penitent sinners to gather. Beyond the altar were backless board benches and beyond them, arranged in a semi-circle, were the society or church tents. The early camp meetings were serious business and children were not in attendance. They were dedicated to the salvation of human souls. Prayer meetings and preaching took place morning, noon and night. Growth was rapid during those early years. Wesleyan Grove grew to become one of the largest and best-known camp meeting sites in the country. From the nine society tents in 1835 and a five-year lease in 1838 growth soon resulted in 17 tents in 1839, 40 tents in 1842, 64 tents in 1847 and an 11-year lease in 1850, 100 tents in 1851 and 200 tents in 1855. By 1860 there were 500 tents of all kinds with 12,000 people attending the Sabbath and in 1868 the number of tents reached 570. At times there were several, and once as many as 36, prayer meetings in progress at the same time. Until 1855 the camp meeting met for one week to ten days and was exclusively religious in purpose. Between 1855 and 1865 the camp meetings began to change in character. They continued to be religious in nature, but the participants also began to enjoy the benefit of the sea air and social interaction as they revived both spirit and body. In 1841 tents (provisional, society and family) had begun to appear in other areas outside the main circle of tents. By 1855 there were 200 tents with only 50 of them being the large society or church tents. More and more family tents were established for the sake of “greater domesticity.” Children began to attend prayer and church meetings. People began to stay for longer periods of time. Small wooden buildings were taking the place of the tents and many of the tents had floors and wooden uprights. Commercial enterprises (boarding tents, victualing tents, barbers, bootblacks, express companies, itinerant vendors, shops) began to appear to accommodate the needs of the many people who attended the camp meetings. Transportation services were expanded. More wells were dug. The Campground was taking on the characteristics of an organized and well-run community. The present Association Office Building, was constructed in 1859 for less than $1,000. The building is 24 x 40 feet, 2 « stories high and has several areas which have been adapted to various needs over the years. These included a large storage room for stray baggage, a post office pro tem., an office for the Agent, storage room for lanterns and oil, lodging rooms for the Agent and music director, meeting rooms, tent storage, a choir practice area and a room to sell lanterns and souvenirs. The original layout of Wesleyan Grove was a simple formation of a circle enclosing the preaching area and the society or church tents. In 1859 a road, now known as Trinity Circle, was built which encircled that area. In 1864, the Association purchased the 26 acres it had been renting. As the area continued to expand (additional grounds were purchased in 1866), it developed in a radial-concentric pattern which was little used in America at that time. Paths radiating from Trinity Circle led to smaller circles where large groups of tents had been located – County Park (Wesleyan Grove), Forest Circle, Washington Park (Victorian Park), Cottage Park Avenue (Cottage Park), Crystal Park (Vincent Park), Washington Avenue (Butler Avenue), Rural Circle and Clinton Avenue, which, at one time, had been the main entrance to the Campground. The smaller circles, some surrounded by larger circles, had small paths radiating from them leading to other circles or parks. The method of the grounds layout was an additive one of discrete neighborhood units, each built around small various shaped parks. Some street and park names (current names are in the brackets) have been changed for various reasons over the years. Between 1859 and 1864 a new American building type, the “Martha’s Vineyard” cottage, remarkable in its singularity in appearance and structure, was developed at Wesleyan Grove. The architectural form is unique and must be considered as an invention of local carpenters. There were about 40 cottages in 1864, 250 in 1869 and 500 by 1880. The number of cottages has decreased over the years as some were moved to other Oak Bluffs locations, some were joined together to form larger cottages and some fell into disrepair and were torn down. Today there are approximately 318 cottages remaining. Most of the cottage owners were of moderate means and the cottages they built were small, costing somewhere between $150 to $600 each (the most expensive one was built at 10 Trinity Park by Governor Sprague of Rhode Island for a cost of $3,500), but the cottages probably would have been small anyway for they replaced the tents and were inspired by tents. They had the same size doors and they huddled together like the tents that preceded them. The cottages are built of tent frame inspired construction with vertical tongue-in-groove random width long leaf yellow pine boards (one length from plate to rafters) which formed the interior and exterior walls. The short side of the two-story rectangular buildings faced toward the front. A wide double door centered on the first floor is reminiscent of both tent openings and church doors. To each side of the entry is a small narrow window. On the second level, under the 90 degree angle of the gable with its 45 degree roof pitch, another double door opens onto a balcony that projects over the entrance. The cottages were usually divided into two or three rooms on the ground floor with sleeping rooms above. The upstairs furniture was brought into the cottages through the upstairs double doors since the larger pieces could not be carried upstairs through the narrow stairways. The distinctive filigree was produced in a mill by carpenters, using the then recently invented band saw, located at the end of Old Mill Road close to the present location of the East Chop Beach Club. The porches and porch roofs were added in the 1880s. In the year 1860 the name, Martha’s Vineyard Camp-Meeting Association, was fixed in the articles of agreement and a formal association called the Board of Directors (21 members) was formed. On May 1, 1868, the MVCMA was made a corporation by act of the Senate and House of Representatives of the Commonwealth of Massachusetts. In 1866 a group of gentlemen, under the name of the Oak Bluffs Land and Wharf Co., purchased the land between the MVCMA and the ocean for the purpose of developing the area as a summer resort. In the eyes of many of the people attending the camp meetings, this new group took on the form of the devil and a threat to the more serious nature of the camp meeting. In 1867, fearing irreligious contamination, the MVCMA erected a high picket fence (rebuilt in 1886) along the boundary between the Campground and this area. The fence was seven feet high and the gates were locked at night. A mammoth tent was placed over the seats where the camp meetings were held for a cost of $3,000 in 1869. The great oaks had thinned out and the tent was needed for protection from the sun and rain. It was used for ten years until it was replaced by the Tabernacle. The first Illumination Night was sponsored by the Oak Bluffs Land and Wharf Company in 1869. They called it Governor’s Day in honor of the Governor of Massachusetts who was on hand for the fete. Everyone took part and there was no distinction between the resort and the Campground. Everyone tried to outdo one another in the display of Oriental lanterns and other forms of illumination. Today the event is centered within the Campground. The first railroad on the Island had horse-drawn cars and was constructed in 1873 to facilitate the movement of people from Highland Wharf onto the Campground. Pieces of the track may still be seen in front of the Association Office building. The following year a steam propelled railroad was constructed to connect Oak Bluffs to Edgartown and Katama, and in 1895 an electric railway was built which ran from Vineyard Haven to Oak Bluffs. 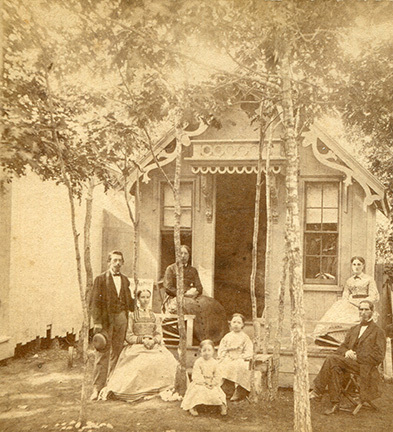 The great Campground event of 1879 was the construction of the unique iron Tabernacle for a total cost of $7,147.84 by the firm Dwight and Hoyt of Springfield, Massachusetts. It was originally intended that the Tabernacle be built of wood but the bids exceeded the Board of Directors’ ceiling of $7,200.00. The coffers of the MVCMA had been diminished by the building of the Methodist Church in 1878 for a cost of $7,748.09. When campgrounder J. W. Hoyt told the MVCMA Board that he could build a wrought iron Tabernacle for less than the cost of a wooden one, they approved the idea. By the time the plans were approved, it was already April of 1879. The Tabernacle was fabricated and assembled on site and the first service was held on July 26, 1879. Topped by a large lighted cross since 1926, which towers above the town of Oak Bluffs, the MVCMA Tabernacle has become a “Beacon to All” across Nantucket Sound. Standing at the heart of the MVCMA grounds, it has been the hub of religious and cultural activities on the Vineyard for over a century. The iron Tabernacle is an extraordinary 19th century building and one of the few remaining examples of wrought iron structures created at the time. It is a product of the remarkable architectural design innovations and developments of that century. The soaring arches and unique construction of the Tabernacle make it one of the most artistic buildings in America. The area combining the Campground and the growing resort was separated from Edgartown, over a disagreement about taxes, and was incorporated as Cottage City in 1880. It remained Cottage City until 1907 when the name was changed to Oak Bluffs. In 1885 Grace Chapel was built for the women leaders of the Methodist Church to house their many and varied activities. Originally located at the west end of Trinity Park, it was later moved to its current location near the intersection of Trinity Circle and Fourth Avenue. In 1890 the roads of the Campground were dug up and water pipes were laid throughout the grounds and by 1903 flush toilets and cesspools began to replace the existing privies which were condemned in 1911. Prior to the laying of water pipes, there were at least 10 wells and pumps at convenient points around the grounds. The roads were dug up, once again, in 2000 when most of the Campground was connected to the Oak Bluffs sewer system. From the modest one-half acre site in a “venerable grove of oaks” selected by Jeremiah Pease in 1835, the MVCMA has grown to today's 34-acre parcel of land on which over 300 cottages, a Tabernacle, an Administration building, a church, a chapel, a maintenance building and several commercial buildings all equipped with the modern conveniences of today’s world reside. Over the years the MVCMA has become increasingly interdenominational. Whereas the MVCMA was established by Methodists, and, for much of its history, was governed exclusively by Methodists, it has always been an autonomous organization and was never formally affiliated with the New England Conference of the United Methodist Church. Historical records document the participation of many non-Methodists at the early camp meetings, both in the congregation and in the pulpit. The Tabernacle continues to exist as a “Beacon to All” and continues to serve as a religious and cultural center for the residents of the Campground, Oak Bluffs and the Island itself. It is the largest venue on the Vineyard and, with its marvelous acoustics and beautiful setting, local groups, musical groups, individual performers, theater groups, choruses and even the Boston Pops Esplanade Orchestra find enthusiastic audiences. The MVCMA offers a wide variety of cultural and religious programs throughout the summer season (July and August). The unique character of the Campground, a heritage from quite a different day, has been wonderfully preserved by the many generations of cottage owners. The boundaries of the Campground are clearly defined, enough to move some to say that when they enter the grounds it is like entering another world. To step into the Campground is to step back 100 years into a civil and indeed into a civilized way of living.